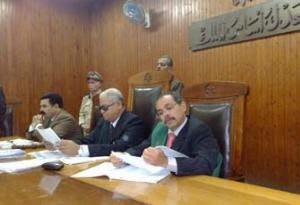 29/10/2009 Egypt’s Higher National Security Court on Wednesday decided to adjourn the trial of what has been known as the “Hezbollah cell” till Thursday after the court accepted the withdrawal of the defense panel and decided to commission 19 other lawyers for defense. Meanwhile, one of the defendants accused his Egyptian interrogators of "brutal torture" that has left him deaf in one ear. Mohammed Mansur, on trial with 25 other defendants, told AFP during a break in a court session that he and all the others had been "brutally tortured," saying his health was failing. "All the detainees have been tortured. I lost hearing in my right ear because of the constant torture. I was electrocuted and beaten," he said. Mansur lawyers said Mansur had admitted under torture that he proposed attacks against "Israeli targets" in Egypt to avenge the assassination of senior Hezbollah commander Imad Moghniyeh, but was turned down by his superiors. "I am innocent of any charges regarding attacks towards Egypt," said Mansur.” "My task was to send support for our brothers in Gaza,” he added. The defense says the prosecution has not presented the evidence it said was in its possession, such as explosives and arms allegedly found with some of the defendants. Local and international human rights groups say torture is routine in Egypt. "Every year, we have 12 to 20 deaths from torture in the country," Hafez Abu Saada of the Egyptian Organization for Human Rights told AFP. Egyptian security officials allege the defendants in the trial have been examined by doctors who found no traces of abuse. Earlier this month, Hamas said Egyptian security men tortured a senior official's brother to death in prison in the northern city of Alexandria. Egypt denies the allegation. THIRD INTIFADA OR FINAL SOLUTION? KASRILS: WHO’S AFRAID OF RICHARD GOLDSTONE ?